But despite these advances, there is far more that we simply do not understand about smallpox disease or its causative virus. The smallpox vaccine, vaccinia virus, remains the poster-child for human vaccines, but we have only begun to understand how vaccinia-induced immune responses protect vaccinees from orthopoxvirus infections. … In contrast, we still do not understand why smallpox disease was so lethal in humans, or if host responses such as the oft-quoted and still poorly-understood “cytokine storm” is really a key instrument of the disease pathophysiology. In fact, we do not comprehend the basis for the strict host tropism of variola virus for humans, nor why there are no animal reservoirs. So, there is really no scientific debate about whether variola virus still has much to teach us about human immunology and viral pathogenesis in general. Instead, the main flashpoint for debate remains the issue of risk versus benefit at acquiring any more scientific information with live variola virus. Not that anyone asks me, but even if they did, I don’t know which side of the destroy smallpox stocks/keep smallpox stocks debate I come down on.3 I lean slightly toward destroying the stocks, but I also think there’s not a lot of point to it; there are almost certainly unregistered stocks out there, whether in a terrorist’s hands (I doubt that), or some nation’s official-unofficial stocks (I do believe this, and suspect there may be quite a few such stocks, but that’s just my cynicism speaking), or in the bottom of some old-time virologist’s freezer marked “AFR45UNK0450” (I did my Master’s degree with one such old-time virologist, and I’ll tell you, the bottom of his freezer was a marvel indeed, though I don’t think there was any smallpox per se). Still, history makes it very clear that viruses can escape from research labs. I’ve pointed out a number of such cases: Foot and mouth disease escape from the Pirbright research station, probable Dengue escape from a lab, probable escape of H1N1 influenza leading to the 1976 pandemic. 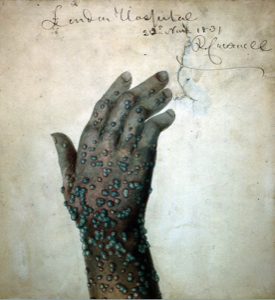 4 And, of course, the last case of smallpox in the world was itself a lab escape. Reducing the number of labs containing smallpox stocks should reduce the risk of an escape. Science. 1993 Nov 19;262(5137):1223-4. The remaining stocks of smallpox virus should be destroyed. Mahy BW, Almond JW, Berns KI, Chanock RM, Lvov DK, Pettersson RF, Schatzmayr HG, Fenner F.
Destroying the stock almost feels like a version of ‘censorship’… taking away what could be used for good (research, greater understanding) because of the fear of an ‘outbreak’ seems wrong.